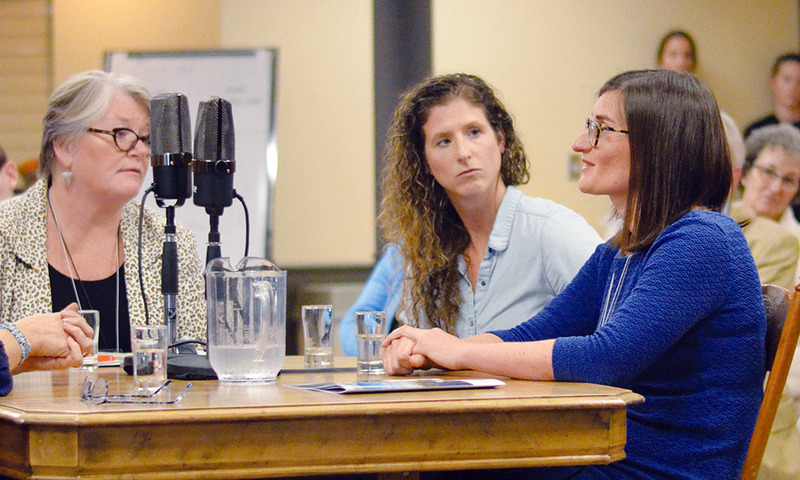 The Rural Talks to Rural (R2R) Conference, a production of the Canadian Centre for Rural Creativity, looked to the past to tackle some very modern problems with the recreation of the old Farm Radio Forum. 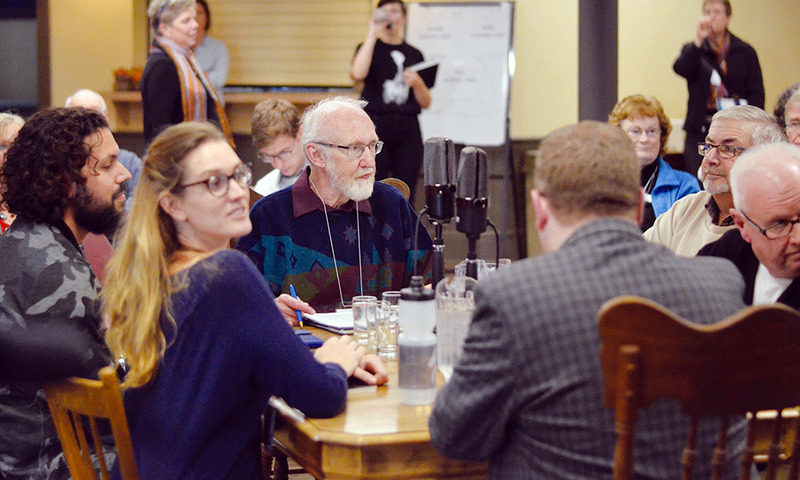 Brought back thanks to the efforts of retired The Citizen publisher Keith Roulston, the Farm Radio Forum at this year’s R2R conference echoed an old radio program on CBC that encouraged discourse and feedback from kitchen tables across the country in decades past. The forum was recreated in the lower hall at Blyth Memorial Hall as part of the R2R conference which took place last week and, through two separate panels, tackled women’s experiences in rural settings and rural investment strategies. Like its inspiration, the forum was broadcast, though instead of being national, these discussions reached across the world via Facebook. 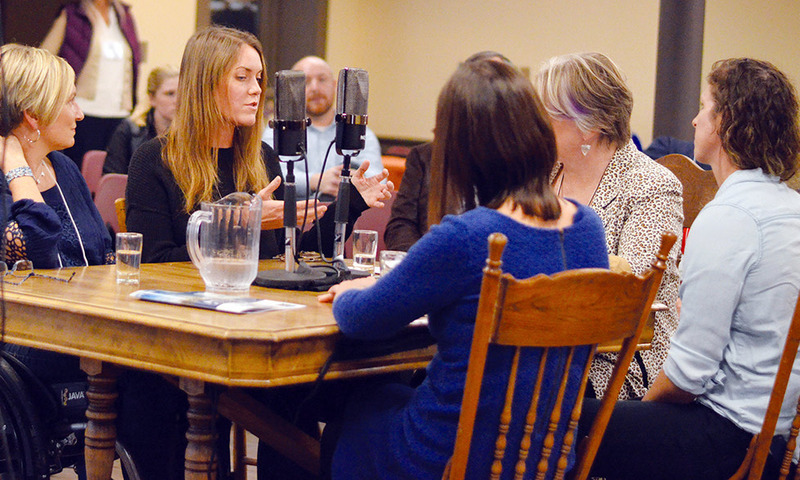 The forum featured moderator Kimberley Payne, who manages Jessica’s House, a residential hospice in South Huron. 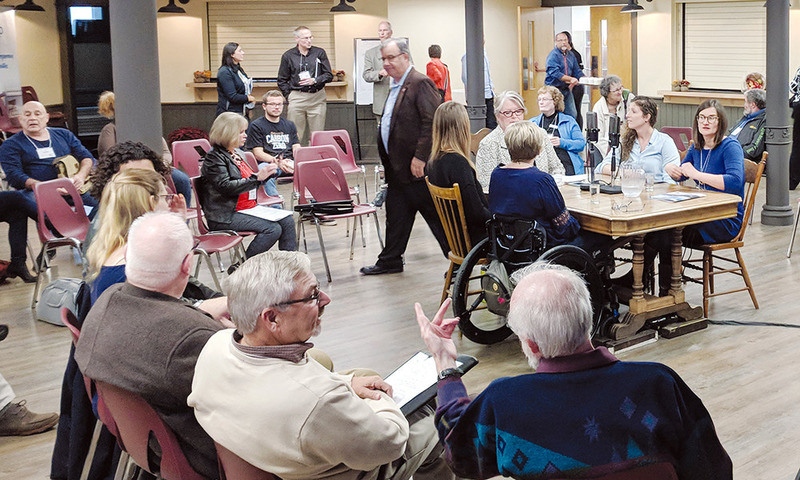 Joining Payne were Huron County business owners Nadine VandenHeuvel and Jen Pate, accessibility advocate and professional Julie Sawchuk and University of Toronto public policy expert Rebecca Hasdell. The conversations between the five women focused on ideas they had generated during meetings prior to the R2R conference and while many themes were discussed, two topics kept coming up: support and inspiration. Whether it was supporting one’s own business through advocacy or finding support through online networks and friends, all five women pointed to support, or finding a “tribe”, or network of like-minded people to talk to, as being crucial to their successes. Inspiration, whether it was them being inspired or inspiring others, was also discussed several times around the table. Pate, who runs Windmill Lake and Eco Park outside of Bayfield, said that inspiration is important to what she does, but being inspired and having passion can be lonely if women don’t reach out and find like-minded people. Hasdell agreed, and said that, with women reaching positions of leadership, a change from what has been long-standing, it can be difficult to find people with similar experiences, but it is necessary. Sawchuk, who was thrust into the world of accessibility when she was paralyzed from the chest down as a result of a cycle-vehicle collision, coined the term “finding a tribe” for purpose of the discussion. She explained that having a group of people to not just debrief with, but to bounce ideas off of each other was important. She said it can be both inspiring and supportive to “find a tribe” and pointed to her own experience of being able to find more people with similar experiences in larger city centres than in rural Ontario. Later on Sawchuk theorized that may be because rural women are conditioned not to ask for help, and that learning it’s okay to look for help and support is vital. VandenHeuvel, who runs Goderich Fit Body Boot Camp, explained that it can be difficult sometimes because there are few people for her to bounce ideas off. The rural investment discussion was moderated by Keith Roulston and featured former United Communities President and CEO and former chair of the Huron Economic Development Committee Jim Lynn, Chelsie Hunt of the Fair Finance Fund, Andre Vashist of the Pillar Nonprofit Network, current chair of the Huron Economic Development Committee and business-development company owner John Marshall and Ryan Gibson, assistant professor in the school of environmental design and rural development at the University of Guelph. The rural investment discussion focused on keeping investment dollars local and each of the panelists had a different opinion on how. Gibson, for example, felt that end-of-life gifts must be handle properly, pointing to well-maintained community endowment programs as an example. He, later in the discussion, explained that residents of rural settlements create stronger attachments to their communities, which can be a financial driver for donation or investment opportunities. Vashist said that funds need to be re-invested locally on top of grants to create economic development. Lynn spoke about the importance of “removing friction” for people who want to invest locally, and suggested that, given the complexity of investments, a guide to investing opportunities would be a boon for rural settlements. Hunt agreed saying that those who know about investments are privileged in a way that others aren’t, and that investment ideas need to be made accessible by everyone who has the opportunity to invest. Gibson said it would be extremely challenging to accommodate the creation of such opportunities, but suggested that the priority should be on continously asking questions to get to the right answer. Vashist’s take on it was that there are organizations that can help, pointing to community foundations, credit unions and emerging investment networks. He said those networks and opportunities need ‘champions’ for generating these opportunities, which could rely on well-known community members. Lynn said part of the process to find those opportunities would be to “write the story” about what a community is trying to achieve and use that as a guide. Video of the entirety of both discussions are available through the Talk Rural Facebook page.